A video package opens the show highlighting James Ellsworth getting a pinfall victory over WWE World Champion AJ Styles last week with help from Dean Ambrose. Backstage, we see James Ellsworth warming up when he looks up and sees Dean Ambrose holding a new Ellsworth t-shirt. Ambrose says tonight is James’ night and that he called in some favors to get that shirt on WWE Shop today. Randy Orton is out first to kick off the show tonight live in Denver. Mauro Ranallo, JBL and David Otunga discuss at ringside Orton’s recent issues with Bray Wyatt. Orton has a mic and says he has to give credit where credit is due. “The evil inside of Bray Wyatt runs deeper than I ever thought possible.” He compares Wyatt to quick sand in that the harder you fight, the more you are pulled down into the darkness and he feels like he is going crazy. Orton said this is a problem for Bray Wyatt and credits him for setting him free. He tells Wyatt he is coming for him. The lights go out and we see Bray Wyatt in a coffin backstage surrounded by people wearing black masks. Wyatt opens his eyes and begins laughing. “Randall…get a hold of yourself. You don’t have to come after me. Because I’m coming after you.” He tells Orton he is about to take him on a journey where he will be gasping for his last breath of air over and over again. “I’m having so much fun Randy. Aren’t you? 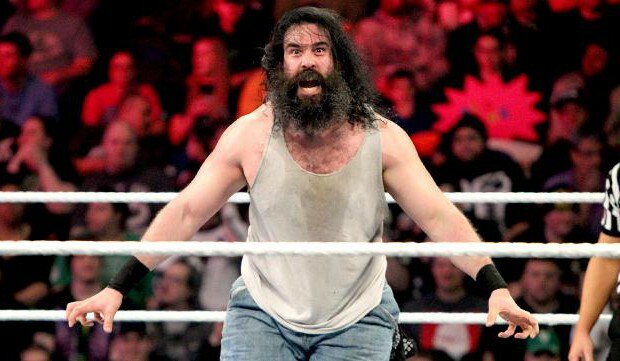 By the way…he’s here.” Luke Harper walks out out stage and heads to the ring. Lock up and Orton quickly pushes Harper away. Orton with kicks and uppercuts to Harper. Harper with a shove and a dropkick that sends Orton out of the ring. Orton counters a suicide dive attempt from Harper cutting it off with a big elbow. Back inside, Harper fights off Orton in the corner and Orton cuts off Harper on the second rope with right hands. Orton with a superplex on Harper off the corner. The lights go out. Bray Wyatt’s music plays. Wyatt is being brought to the stage in his casket with the masked people. Back live, Wyatt is now out of the coffin and staring down Orton who is at ringside as the referee begins a count. Orton slides in at 9 and Harper drops an elbow right away. Harper with a Michinoku Driver on Orton for a two count. Harper with a gator roll on Orton and then keeps him grounded with a headlock. Wyatt is yelling at Harper to bring Orton to the casket that remains open. Orton tries to toss Harper in the casket. Harper counters and then eats a few clotheslines from Orton including a snap powerslam. Orton is going for his DDT through the ropes on Harper when Wyatt hits the ring attacking him. The referee calls for the bell. After the match, Luke Harper levels Randy Orton with a big boot. Bray Wyatt with right hands and stomps to Orton. Harper gets in a few stomps of his own. Wyatt walks back over to the casket that was closed. When he opens it, Kane is inside and sits up. Kane with a shot to Wyatt and Harper on the ring apron. Kane goes up top, Orton with a DDT off the ropes on Wyatt and Kane off the top rope with a flying clothesline on Harper. Kane is calling for a clothesline and Orton is gearing up for an RKO when the lights go out. When the lights return, both Wyatt and Harper are gone. Kane does his pose to have the corner pyro go off. Backstage, WWE World Champion AJ Styles is asked about his thoughts on having to defend his title tonight. Styles talks about earning the right to be called the face that runs the place, yet here he is with a “no talented, waste of space, fat skinny turd, James Ellsworth.” He predicts Dean Ambrose will try to get involved tonight and how this could be like WCW all over again when David Arquette won the WCW Championship. Styles talks about it being embarassing just being in the ring with Ellsworth. He promises to take out Ambrose if he interferes in this championship match tonight. WWE Intercontinental Champion Dolph Ziggler and WWE Smackdown Tag Team Champions Heath Slater and Rhyno vs. The Miz vs. The Spirit Squad will take place tonight. Up next: Naomi vs. Alexa Bliss. Lock up and Bliss pushes Naomi away. Bliss with a shove. Naomi returns with one of her own. They exchange shoves and Bliss gets behind the referee to break it up. Naomi with a Lou Thesz Press and right hands to Bliss. Bliss with a huge knee and tosses Naomi face first off the mat. Naomi with repeated kicks to the body of Bliss and follows with a standing dropkick. Naomi catches Bliss with a kick to the head from the ring apron. Naomi springboards off the top rope and takes out Bliss with a cross body for a two count. Naomi with a quick leg drop over Bliss and goes to a headlock to keep it grounded. Noami with a drop toe hold sending Bliss face first into the bottom turnbuckle. Bliss rolls out. During the break, we see Bliss landing a big right hand to Naomi on the outside. Back live, Bliss has a front face lock applied on Naomi and rolls through a Naomi counter attempt. Naomi fights out with a backbreaker on Bliss. Naomi with a flipping dive, lariat and sitdown jawbreaker combo on Bliss. Naomi with a split legged moonsault from the corner over Bliss for a two count. Bliss crotches Naomi when she goes up top. Bliss tosses Naomi down and hits her Twisted Bliss off the top turnbuckle to get the pinfall. After the match, Renee Young is with Alexa Bliss talking about Bliss challenging Becky Lynch for the WWE Smackdown Women’s Championship. Bliss said in three weeks the fairy tale is over. “The wicked witch is dead.” She said a new champion will be crowned. Footage from last week is shown of Dolph Ziggler defeating The Spirit Squad in a handicap match and then The Miz attacking Ziggler after the match. We also see Heath Slater and Rhyno hitting the ring to make the save for Ziggler. Curt Hawkins will make his Smackdown Live in-ring debut up next. We are back live as Apollo Crews is in the ring ready for action. Curt Hawkins is out next to make his in-ring debut. Hawkins grabs the mic and tells Crews to prepare himself to “face the facts.” He said all Crews has to fear is fear itself…and Curt Hawkins. Hawkins said after tonight, Crews will have to change his name to Apollo Lose. Crews with a right hand to Hawkins. Hawkins rolls out of the ring. He said Crews ruined his big debut. Hawkins drops the mic and says he is leaving. He heads up the ramp and goes to the back. Carmella is headed to the ring. Carmella heads to the ring. We see footage of last week of Nikki Bella going after Carmella and Carmella getting away. Back live, Carmella has a mic and talks about Nikki Bella ruining her moment at SummerSlam in Brooklyn. She doesn’t get Nikki’s popularity. Carmella said it is your lucky day because she is here to spill the truth. Nikki Bella’s music hits and she walks out to interrupt. Nikki grabs a mic and says Carmella can say what she has to say to her face. Carmella talks about Nikki being able to get away with anything around here since her boyfriend is John Cena. She refuses to walk on eggshells around here and says Nikki isn’t fearless because she goes home with Cena. Nikki congratulates Carmella on being a jealous hater. Carmella accuses Nikki of trying to hide something. Nikki is confused and says they aren’t trying to hide it. She chooses to focus on her role as a wrestler on this show. Nikki calls Carmella an internet bully. Carmella said she is just exposing Nikki for the needy, whiny, “gold digger” that she is. She has a clip for Nikki. It’s footage from Total Bellas and Nikki coming off very needy. Back live, Carmella is smiling. Nikki says Carmella knows how to edit and talks about paving her own road. “I wear the damn pants in my relationship,” said Nikki. She talks about “they” not believing in her and how she trained even harder. Nikki talks about being counted out when she hurt her neck and she wears the word “fearless” on her shirt proudly. She adds not being afraid of some Boss or Queen and especially not some girl from Long Island. Carmella said she tells the truth and truth is that Nikki used her looks to get her foot in the door. “You used your sister to get your foot in the ring. And you used your boyfriend, John Cena, to become a celebrity.” Carmella drops the mic and rolls out of the ring heading to the back. Backstage, Renee Young talks with James Ellsworth about facing AJ Styles tonight for the WWE World Championship. Ellsworth said he is very nervous, but last week he found himself in a match last week with AJ Styles and somehow he survived. He said tonight he gets to tell his grandchildren that he competed for the WWE World Championship on Smackdown Live. Young wishes him good luck later tonight. WWE Intercontinental Champion Dolph Ziggler and WWE Smackdown Tag Team Champions Heath Slater and Rhyno vs. The Miz vs. The Spirit Squad is up next. Before the match, Heath Slater said they came out last week to help Dolph Ziggler to set a good example for his kids. Rhyno said he just doesn’t like male cheerleaders. We start wtih Rhyno and Mikey. Lock up and Rhyno with a headlock on Mikey. Mikey with a headlock on Rhyno. Rhyno with a quick shoulder tackle on Mikey and a shoulder charge in the corner. Mikey with an elbow and kick to Rhyno. Tag to Kenny who comes off the second rope, Rhyno catches him and hits a belly-to-belly suplex. Tag to Heath Slater. Rhyno and Slater with a double elbow on Kenny. Slater with an arm drag to Kenny. Tag to Dolph Ziggler who throws a big right hand to Kenny in the corner. Kenny catches Ziggler with a leaping back elbow. Miz is yelling for a tag. Miz gets the tag and eats a quick dropkick from Ziggler. Ziggler with a corner splash, goes for a neckbreaker, Miz throws Ziggler to the corner and kicks away. Miz distracts the referee allowing Mikey and Kenny to get in a few shots. Ziggler almost gets a superkick on Miz as Miz quickly rolls out of the ring. We are back live as Maryse trips up Ziggler against the ropes allowing Miz to take advantage. The crowd is calling for a Slater hot tag. Miz cuts off a hot tag attempt dropping Ziggler down by his hair. Tag to Kenny who comes off the second rope with a shot on Ziggler. Kenny with a quick stomp over Ziggler. Mikey with the tag and takes a counter suplex from Ziggler. Tag to Miz who cuts off a hot tag to Slater. Miz sends Rhyno off the ring apron. Ziggler catches Miz with a quick superkick. Tag to Kenny. Hot tag to Slater. Slater with a big boot to Kenny and knocks Mikey off the corner. Slater with another running boot to Kenny and then another for Mikey. Slater with a jumping neckbreaker for a two count on Kenny when Mikey breaks it up. Gore on Mikey. Kenny sends Rhyno out of the ring. Slater rolls up Kenny for a two count. Miz with a shot on Slater through the ropes. Kenny rolls up Slater for the pinfall. Backstage, Daniel Bryan is talking with Shane McMahon about RAW accepting the open challenge for Survivor Series and how they need to make teams. Natalya walks up to interrupt. She wants to be part of the 5-on-5 women’s match at Survivor Series. Bryan asks why her. She thinks she can lead the way and give the women a sense of pride to beat RAW. Bryan asks if she just quoted Whitney Houston and will take that under consideration. Jack Swagger is in the ring when we return live. Members of the Denver Broncos are shown sitting at ringside. Swagger with a shoulder tackle early on Corbin. Swagger clotheslines Corbin over the top rope to the outside. Swagger jumps out and sends Corbin back inside. Swagger with a right hand to Corbin from the ring apron. Corbin with a tackle that sends Swagger flying off the ring apron into the ring barricade. Corbin with some powerful forearms to Swagger. Back inside, Corbin catches Swagger with a knee and then hits End of Days for the win. Backstage, Dean Ambrose walks in Daniel Bryan’s office and is wearing a referee shirt. He is ready to be unbiased and call it right down the middle. Bryan said Ambrose can’t be the referee tonight. He said Ambrose can be ring announcer, timekeeper or whatever. Ambrose said he will do that. Bryan asks Ambrose which one as Ambrose leaves. Dean Ambrose is headed to the ringside area for the main event. Dean Ambrose will be our ring announcer tonight. AJ Styles was not happy about this match during his entrance. James Ellsworth has music and graphics now. Ambrose introduces the challenger Ellsworth (loud “ELLSWORTH” chants) and the champion AJ Styles. Ambrose runs out of the ring and is now the official timekeeper tonight. He keeps ringing the bell. Styles is not happy as he starts yelling at Ambrose. We are back live as Styles goes for a rear chin lock and Ellsworth slips right out. Styles with a right hand to Ellsworth. Ambrose advertises the new James Ellsworth t-shirt on the video screen distracting Styles. Styles tosses Ellsworth across the ring and yells, “Nobody wants your shirt!” Styles with big forearms to the jaw of Ellsworth in the corner. Styles with a dropkick on Ellsworth. Ellsworth pushes Styles to the corner. Styles gives Ellsworth a snap suplex right into the same corner. Styles leaves the ring and yells at Ambrose saying this is all his fault. Styles with a chop to Ellsworth and then puts him up on the top turnbuckle. Styles is going for a superplex when Ambrose is letting someone know in the arena that their car headlights are on. He also reads off Verizon as a sponsor. Ellsworth goes for a cross body, Styles moves and Ellsworth hits the ring with a thud. Styles with a big kick to the chest of Ellsworth. Styles sends Ellsworth to the corner and then to the outside. Ambrose gets up and sends Ellsworth back inside the ring. Styles tosses him back out. Ambrose tosses Ellsworth back in. They go back and forth sending Ellsworth in and out of the ring. Styles gets up on the top turnbuckle and Ellsworth trips him up. Ellsworth with a superkick on Styles! Ellsworth hooks the leg and Styles kicks out after two. Otunga called that No Chin Music. Styles cuts off Ellsworth with a spinebuster. Styles with some stiff elbows to Ellsworth. Styles with kicks to Ellsworth as Ambrose gets on the mic asking if that is the best he can do. He said he knows Styles looks like a soccer mom, but didn’t know he kicked like one too. Styles gets more aggressive with big right hands on Ellsworth. Styles with right hands to Ellsworth in the corner. The referee reaches a 5 count and calls for the bell. After the match, Dean Ambrose announces AJ Styles as the loser of the match. He gets in the ring, AJ Styles charges and Ambrose hits him with Dirty Deeds. Ambrose picks up James Ellsworth and holds up his arm celebrating his second win against Styles. Otunga talks about Ambrose getting to Styles tonight at ringside.